[SatNews] The Volvo Ocean Race is a testament to the skill and endurance of the crews battling the sea and the elements in a trial of seamanship and boat design. The race also illustrates the crucial part communications play in modern sailing. 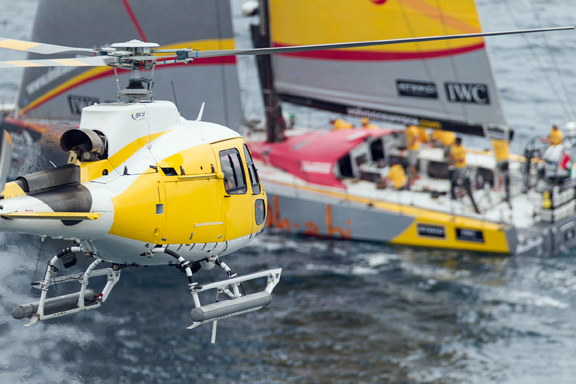 Cobham has a major role in the Volvo Ocean Race 2014-15, supplying technology that not just keeps the boats in touch with the control center and provides vital contact in time of emergency, but is also a key element in video coverage of the race. In a departure from previous races, this Volvo Ocean Race features a one design boat, the Volvo Ocean 65. Each vessel is the same shape and size with identical sails, keel, below deck space and steering mechanisms. This uniformity extends to the communications set-up. The Cobham TCS NETNode Mesh IP radio provides IP connectivity for email and internet access, with COFDM modulation to integrate video, audio and GPS information. "The IP capability gives a lot of flexibility," said Volvo Ocean Race technology director, Jordi Neves. IP connections are carried over a BGAN (Broadband Global Area Network) system, supplied by another Volvo Ocean Race race partner, Inmarsat. Linking into this is Cobham's Explorer 710 BGAN terminal, which works alongside a range of the company's other products, including the Sailor SP3510 portable VHF radio and Sailor 6391 Navtex system. Two Cobham antenna systems sit on the sterns of the boats: a Cobham SATCOM Sailor 500 Fleet Broadband, which is used intermittently for live streaming and transfer of large video files; and the compact Fleet Broadband 250, which is always on and used mainly for email, telemetry and weather information. Each crew includes a non-sailing member, the onboard reporter (OBR), whose main role is to shoot videos, stills and write blogs detailing progress in the race and life on the boats. Working at a media desk below decks, the OBR compiles reports from footage shot on handheld and onboard cameras using Final Cut Pro. These are sent to the Volvo Ocean Race broadcast center in Alicante, Spain using LiveWire M-Link Newscaster software linked to the Cobham Fleet Broadband antennas. Material is then distributed to international broadcasters or transmitted on a dedicated IPTV channel. Footage of onshore events and the arrival of the boats in each port is produced by Sunset+Vine. This includes shots from chase boats and helicopters that follow the racers into harbor. Cobham TCS HD SOLO transmitters are fitted on two rigid-hulled inflatable vessels as well as the aircraft for linking back to the production center. "When Volvo took over the race we made the focus more about the people taking part than the boats and the water," said Jordi Neves. "There are 66 sailors spending 140 days at sea and we want to reflect that using the technology available to us—video, audio, satellite phones and email. Cobham is helping us make that happen."